John Singer Sargent (1856–1925), In the Generalife (1912), watercolour and graphite on paper, 37.5 x 45.4 cm, The Metropolitan Museum of Art, New York, NY. Wikimedia Commons. Even when he was ‘off duty’ as a portrait painter, John Singer Sargent (1856–1925) couldn’t resist painting people. An extremely sociable person who spent much of his career at the height of his profession, he had many friends who were painters, and more than anyone liked to paint those artists at work in the open air. This article looks at some of those paintings. 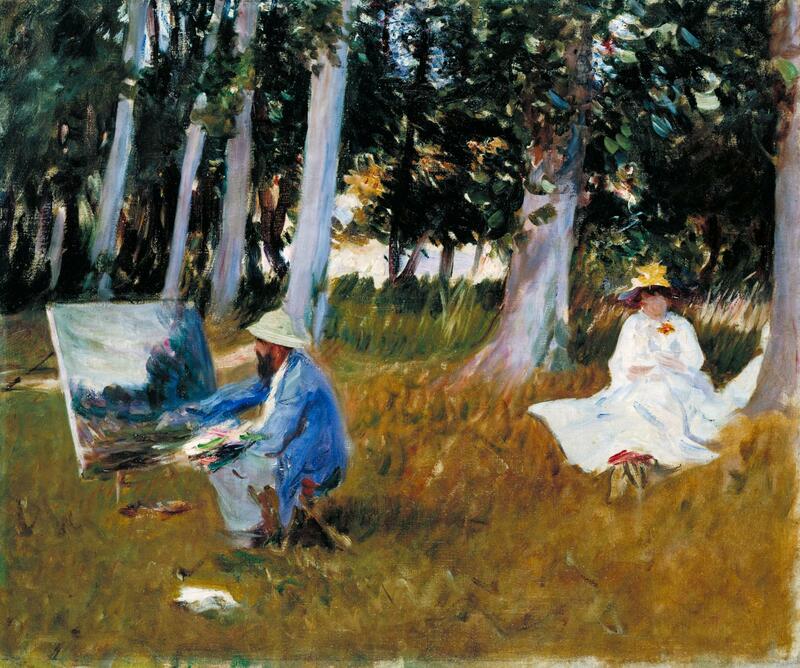 Sargent had first met Claude Monet in 1876, but it is thought that Sargent’s painting of Claude Monet Painting by the Edge of a Wood was made in 1885, when they were painting together at Monet’s house in Giverny. At the right is Alice, Monet’s wife. In that same year, Sargent moved his portraiture studio to London. Monet is working in oils on a large canvas, which rests on a very low easel and appears to be propped at the top. 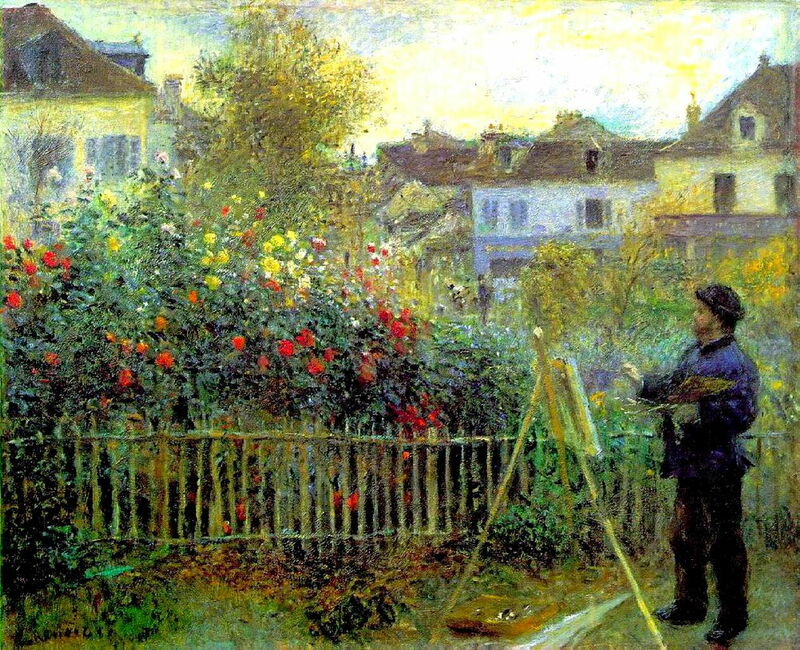 Pierre-Auguste Renoir (1841–1919), Monet Painting in his Garden in Argenteuil (1873), oil on canvas, 46 × 60 cm, Wadsworth Atheneum, Hartford, CT. Wikimedia Commons. The Impressionists occasionally painted themselves at work, particularly during the earlier years of the movement. Above is Pierre-Auguste Renoir’s painting of Monet Painting in his Garden in Argenteuil (1873), and below is Édouard Manet’s oil sketch of Claude Monet in Argenteuil (1874), working in his floating studio. When painting in his garden, Monet uses a conventional lightweight wooden easel, with a small canvas which allows him to work standing. His oil paints are in the pochade box under the easel. 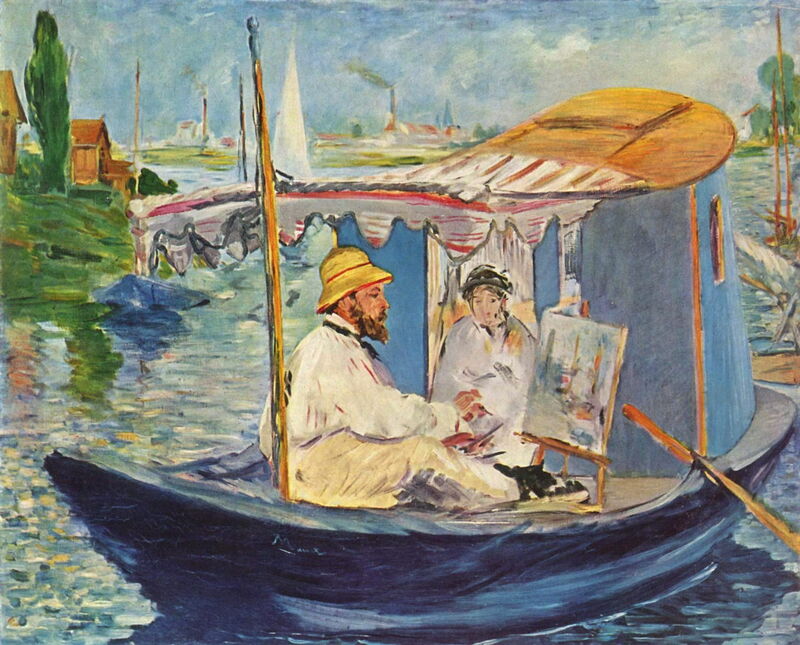 Monet’s position in the boat appears very relaxed, but would have been extremely uncomfortable if he maintained it for long, as he would have to keep bending forward to use his brush on the canvas. This suggests that it may have been a pose for the purpose of this painting. Édouard Manet (1832–1883), Claude Monet in Argenteuil (1874), oil on canvas, 80 × 98 cm, Neue Pinakothek, Munich, Germany. Wikimedia Commons. Sargent met Dennis Miller Bunker (1861-1890) in November 1887, during Sargent’s first working visit to America, when Bunker was a rising star of American Impressionism. Like Sargent, Bunker had trained in Paris, and the two became good friends. Bunker stayed with Sargent in England in the summer of 1888, when Sargent painted him at work, in Dennis Miller Bunker Painting at Calcot. Bunker is seen working on quite a large canvas which is propped up on the ground, using three wooden poles. Even for a young person, this was not a good way to paint outdoors. Strangely, there are no known paintings by Bunker which have survived from this time in England. Bunker tragically died of meningitis just two years later, at the age of only 29. 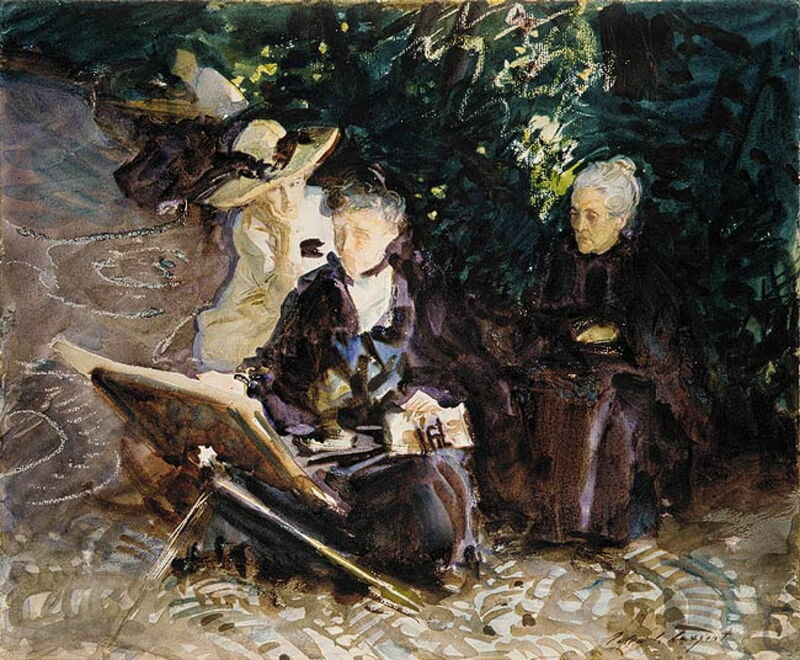 John Singer Sargent (1856–1925), An Out-of-Doors Study (c 1889), oil on canvas, 65.9 × 80.7 cm, Brooklyn Museum, New York, NY. Wikimedia Commons. Paul César Helleu (1859–1927) first met Sargent when the former was a precocious student at the École des Beaux-Arts, in 1876. Sargent was the first person to buy one of Helleu’s paintings, for which he paid the huge sum of a thousand francs. 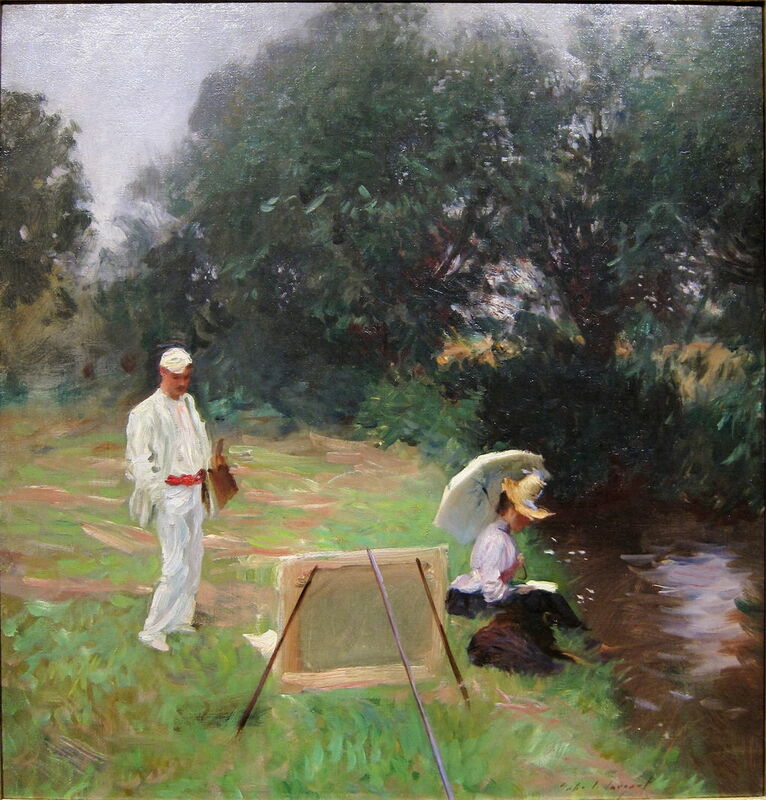 Helleu and his wife Alice remained close friends with Sargent, and the couple often appear in Sargent’s paintings. When he painted them in An Out-of-Doors Study (c 1889), they had been married three years. Helleu is working on a canvas propped up in the grass by a single pole, a precarious arrangement only suitable for the calmest of days. It also forces him to work very low, and he squats in a position of tension, his pochade box in the grass below his left knee. In the summer of 1904, Sargent travelled to the Alps for his first season of serious plein air painting there. He stayed in the Italian mountain town of Purtud, to the south-west of Mont Blanc, where there was a group of Italian artists doing the same thing. Among them was Ambrogio Raffele (1845-1928), probably the best and most experienced of the group; Sargent became particularly friendly with him, and in An Artist in His Studio (1904) shows Raffele at work in his room there. 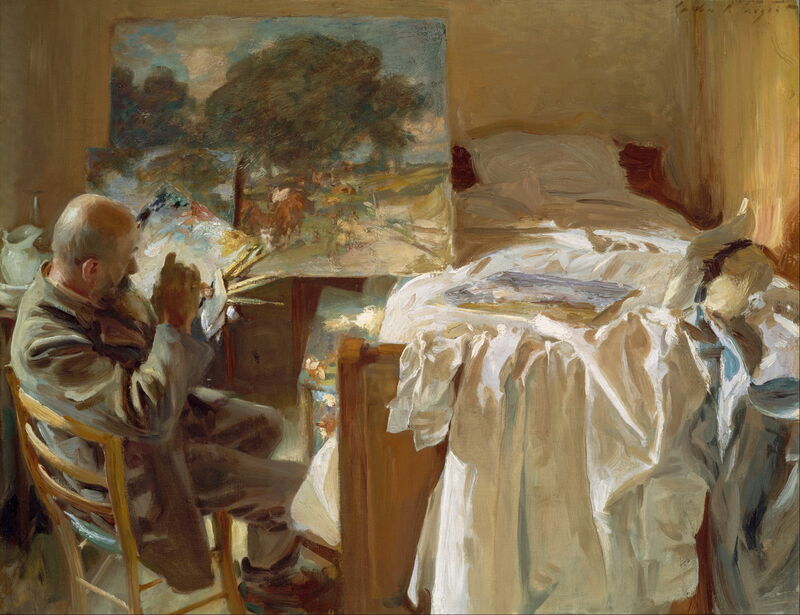 This painting is a paradox, in that Sargent shows an accomplished plein air painter working not in front of his motif, but in his bedroom. It is possible that Raffele is painting a larger version of the small sketch which is seen at the lower left of the large canvas. 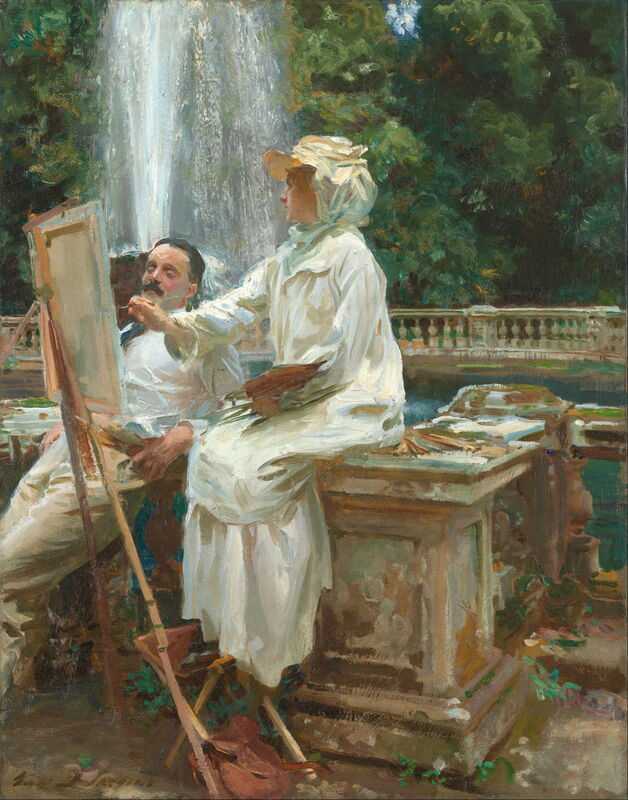 John Singer Sargent (1856–1925), The Fountain, Villa Torlonia, Frascati, Italy (1907), oil on canvas, 71.4 x 56.5 cm, The Art Institute of Chicago, Chicago, IL. Wikimedia Commons. The American artists Jane de Glehn and her husband Wilfrid (1870-1951) were long-standing friends. Sargent first met Wilfrid around 1895 when he was working on murals in the Boston Public Library, and Wilfrid married Jane Emmet (1873-1961, sister of Lydia Field Emmet) in 1904. The Fountain, Villa Torlonia, Frascati, Italy (1907) shows Jane working at a lightweight wooden easel in the grounds of this villa. John Singer Sargent (1856–1925), Artist in the Simplon (c 1909-11), watercolour and graphite on paper, 40.5 x 53.2 cm, Fogg Art Museum, Cambridge, MA. Wikimedia Commons. 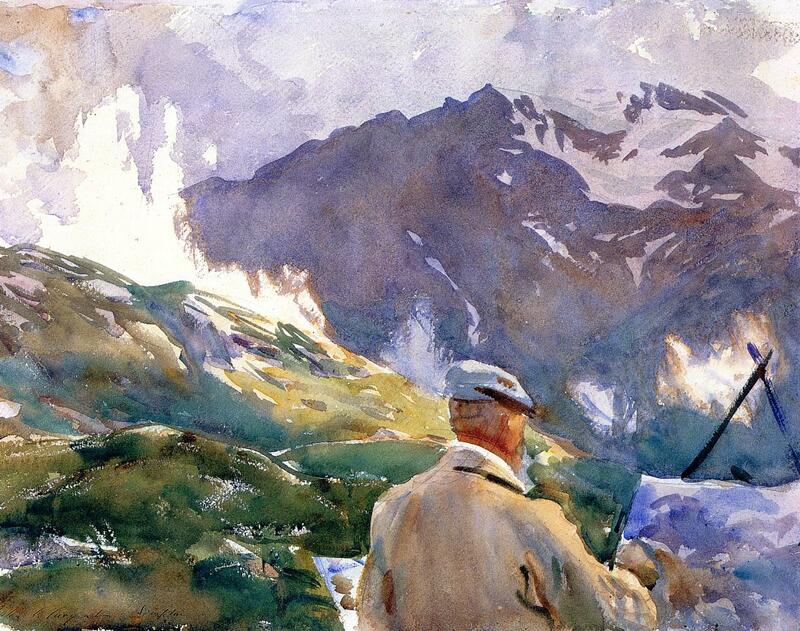 Sargent met up with Ambrogio Raffele again when he returned to the Alps during the summers of 1909 to 1911, and painted this watercolour of him as Artist in the Simplon at some time in those years. Raffele is shown painting a view of the Fletschhorn, which is to the south-west of the Simplon Pass. He is using an improvised rest for his canvas, formed from two crossed poles. Another frequent companion of Sargent’s during his travels was his sister, Emily, who was also a keen artist. In the Generalife (1912) shows her sketching in the gardens of the Generalife in Granada, Spain. She is using a low metal easel with telescopic legs, and kneels sideways to work at it. Behind her is Jane de Glehn, and to the right is a Spanish friend known only as Dolores. The unusual highlight effect seen in bushes above them, and on parts of the ground, was produced by scribbling with a colourless beeswax crayon, which resists the watercolour paint. John Singer Sargent (1856–1925), The Master and His Pupils (1914), oil on canvas, 55.9 x 71.1 cm, Museum of Fine Arts Boston, Boston, MA. Wikimedia Commons. During Sargent’s travels in Europe, he met the British artist Adrian Stokes (1854–1935) and his equally talented Austrian wife Marianne, and they became friends and travelling companions. 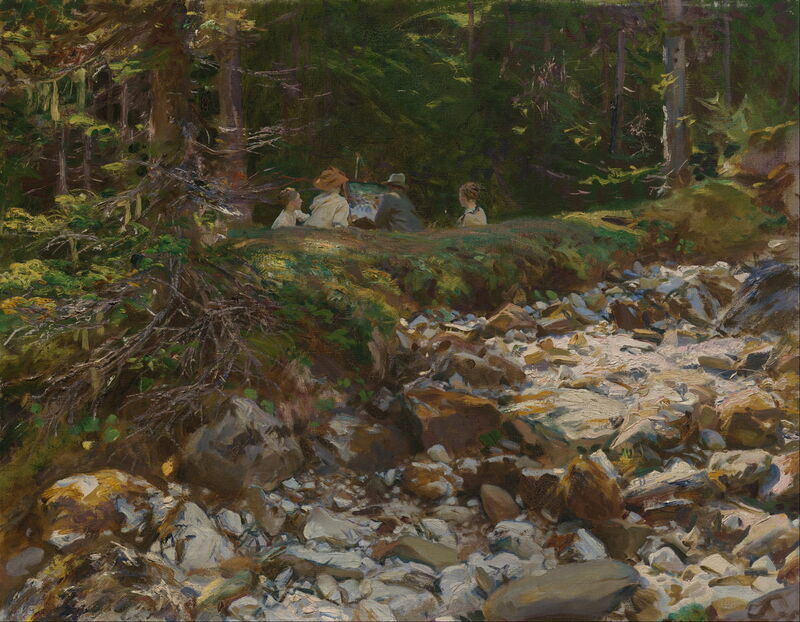 The Master and His Pupils (1914) shows Adrian Stokes and Sargent’s sister Emily apparently engaged in a painting lesson in the Alps. John Singer Sargent (1856–1925), The Sketchers (1914), oil on canvas, dimensions not known, Virginia Museum of Fine Arts, Richmond, VA. Wikimedia Commons. 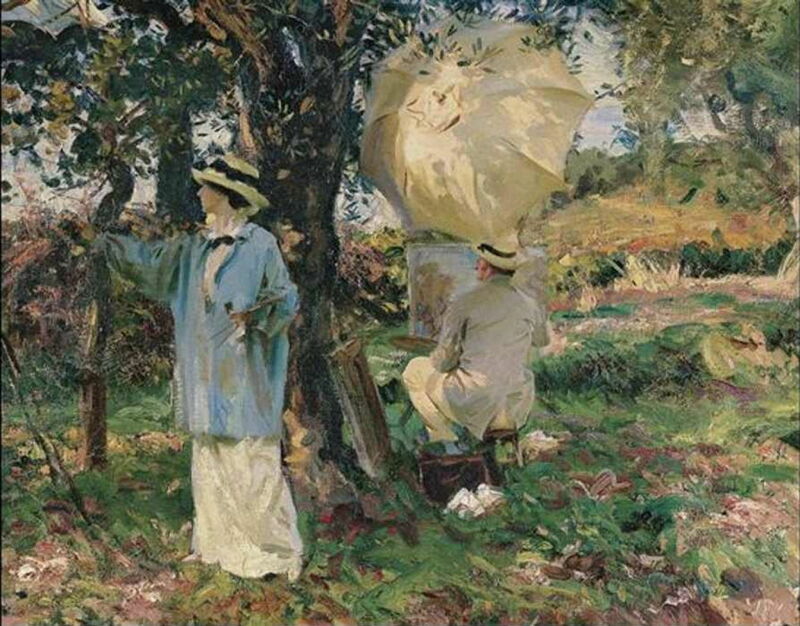 The Sketchers (1914) shows another artistic couple, probably the de Glehns or the Stokes, painting en plein air. Sargent painted these last two works in 1914. He was travelling through much of the summer of that year, and by July had reached Austria in the company of Adrian and Marianne Stokes. When the First World War broke out at the end of that month, they found themselves in a country which was suddenly at war with Britain. The Austrian authorities forbade them from leaving the country, but by the middle of December they had managed to reach Switzerland. Painting idyllic views in the countryside isn’t always as peaceful as you might wish. 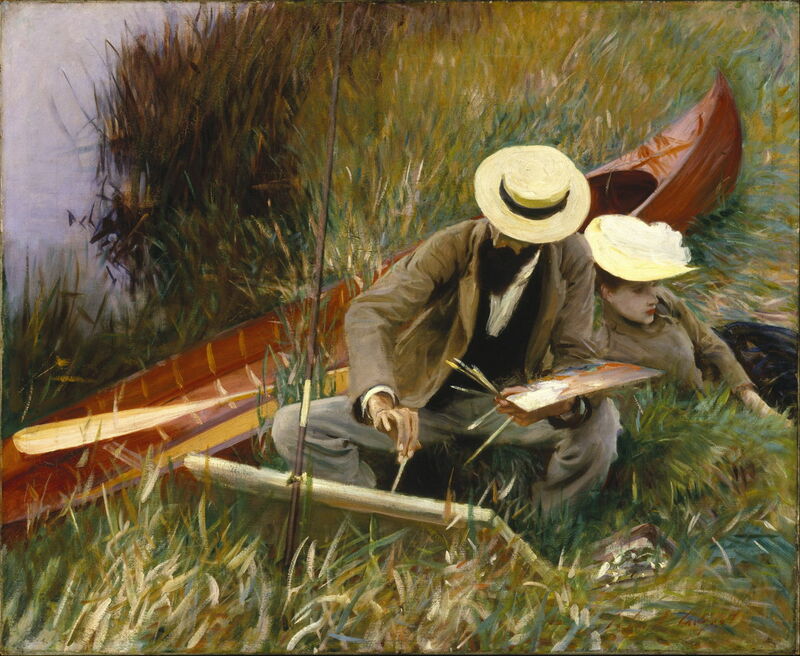 You also need to keep a watch over your shoulder, in case anyone is inspired by Sargent’s wonderful sketches to start painting you painting the view. Posted in General, Painting and tagged Bunker, de Glehn, Helleu, Manet, Monet, painting, plein air, Raffele, Renoir, Sargent, Stokes. Bookmark the permalink. I love Singer’s work and really enjoyed this. I didn’t realize how many paintings of painters at work he had created. Thanks for “curating” this show. Thank you for your kind words. They’re really wonderful paintings, aren’t they?